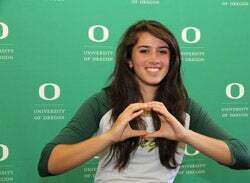 In honor of the remarkable achievements of some of our newest Ducks, the University of Oregon is proud to announce Signing Day 2013. These events are held at the high schools of recipients of the new Stamps Scholarship. 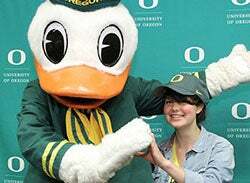 The Stamps award is the UO’s most generous and prestigious undergraduate scholarship, providing tuition, room and board, and access to an enrichment fund that will help them pursue study abroad, internships, or other experiences. Candace is a highly motivated student at Pleasant Hill High School. 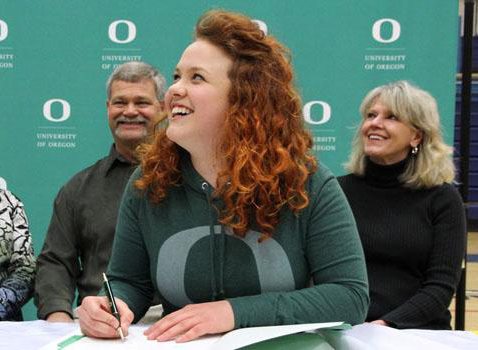 She co-organized Operation: IMPACT, a campaign to combat poverty in rural Oregon. With the help of a student team, Candace and her teacher created the IMPACT Festival, a community-wide event offering resources and outlets for students to join the fight against poverty. She is the Associated Student Body president, Social Justice Club president, and a board member of the Oregon Quarter Horse Youth Association, and she volunteers with the HIV Alliance and is a camp counselor for the Eugene Police Department’s Safety Town program. Kaylee, a high-achieving student at Bend High School, serves as the National Honor Society Secretary and founder of the International Baccalaureate Food Club. In addition to playing the saxophone in the all-state pep band and serving as a veteran member of her school’s mock trial team, Kaylee volunteers at the Humane Society of Central Oregon and with Project Connect Homeless Outreach. She has also written a novel that is currently in the editing stage. Alex, a student at Lake Oswego High School, serves as the Associated Student Body vice president and is a member of the National Honor Society. 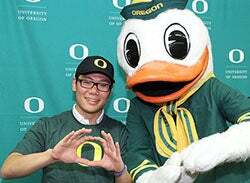 He worked for Oregon Health Sciences University as a research intern and patient care volunteer. Alex moved to the United States from South Korea when he was in fifth grade and is currently an accomplished saxophone musician. Ruby is the French Club president at Cleveland High School where she also participated in an exchange program in Turkey. In addition to being the principal second violin in the Metropolitan Youth Symphony, Ruby is an assistant counselor at the Tryon Creek Nature Day Camp. Hannah, a student at Cleveland High School, cofounded several clubs, including the rugby team, the Math Club, the Jewish Student Union, and the Visible Warriors Club. She participated in an exchange program in France, is a student leader at Outdoor School, and will graduate with a full International Baccalaureate diploma. Her interest in playing musical instruments motivated her to plan and organize Breakout Sessions, a successful music festival. In addition to writing for her school newspaper, Hannah is also the art editor for her school’s literary magazine.